Are you looking for friendship bracelet making instructions? Learning how to make friendship bracelets is really fun and they aren't hard to make at all. There are lots of different types of friendship bracelets, but they all have a common purpose. They are all symbols of the love you have for your cherished friend. Giving someone a friendship bracelet is a great way to show them how much you care for them. Isn't this what you think of as a friendship bracelet? These are really fun to make, and don't cost much in supplies either. I get my embroidery floss from the dollar store down my street - 3 packages for a buck! Doesn't get much better than that does it? If you're new to floss friendship bracelet making, start here! This Floss Friendship Bracelet Basics page will quickly bring you up to speed about: tools, materials, the basic knots, how to finish off the bracelet, fasten the bracelet, and also offers lots of tips. A collection of detailed patterns and instructions. Includes candy stripe, and a number of chevron patterns. 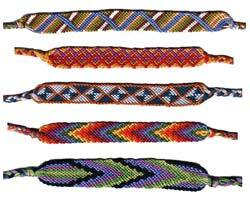 A collection of advanced friendship bracelet patterns. Right now this list is small, but it will be growing soon. The gimp friendship bracelet is one of those unchanging friendship bracelet styles that will always be in fashion. Learn how to make one with these instructions. These friendship necklaces are really easy and quick to make. Once you learn the easy embroidery floss necklace wrapping technique, you can use the knot to make friendship bracelets too. 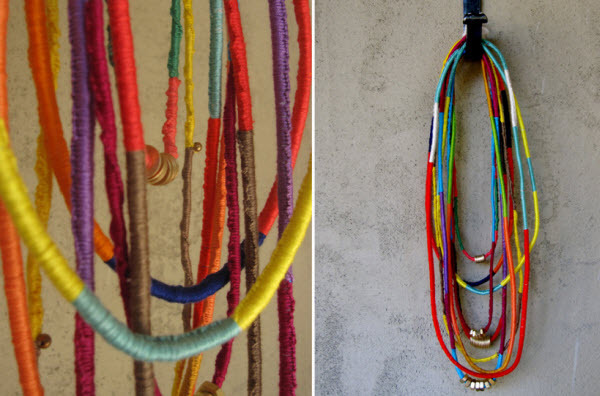 Friendship Bands: * Braiding * Weaving * Knotting (by Marlies Busch, Nadja Layer, Angelika Neeb, and Elisabeth Walch).